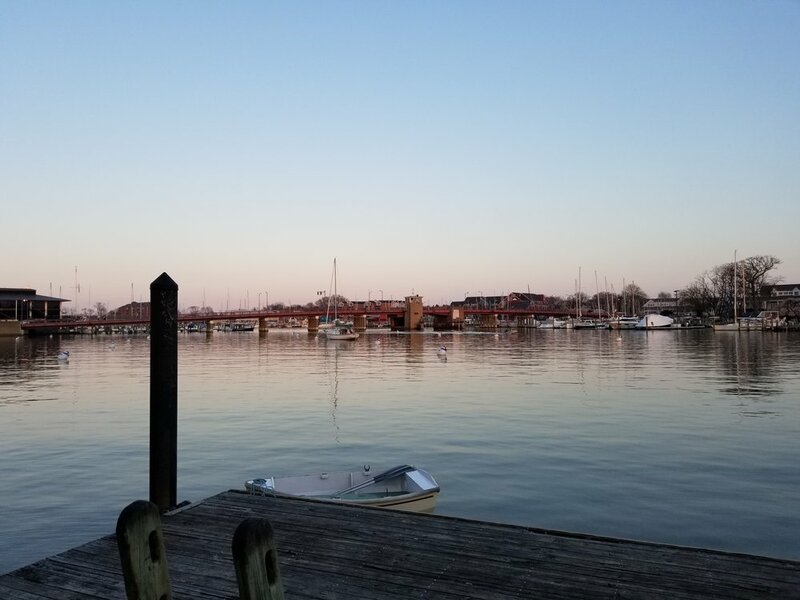 4/6 Saturday, Saint Mary’s Cove Mooring #53, Annapolis, 1334.0, 66/50, morning fog and clouds clearing to partly cloudy - At daybreak, as Dobbs and I were preparing to get underway, fog blanketed Solomon’s, despite a north wind blowing at a steady 10 knots. We motored out onto the Patuxent River, keeping a careful watch for crab pots, fishing weirs, and other vessels. I was monitoring channel 13 as well as 16, so that I could hear any commercial traffic on the Bay. A LNG tanker, assisted by three tugs, was maneuvering at the gas terminal and another tug was heading south. We could see them on the AIS. The more progress we made toward Cove Point, the more the wind and chop built and visibility deteriorated. Because of wind-against-tide and a localized pattern of stronger wind around Cove Point, we knew it could be a slow, lumpy ride motoring into it. Grace, with her long overhangs, hobby-horses almost to a stall in such conditions. I didn’t like the feeling of struggling through that in limited visibility with a LNG tanker and tugs close by, so I requested that we turn back. Dobbs was amenable. We returned to the marina with the plan of waiting an hour and trying again. I took advantage of the time to enjoy a hot shower; Dobbs plugged our heater back in and warmed up below deck. At 10am, we departed Zahniser’s for the second time. The day had warmed a little, visibility had cleared to about 1nm, and the wind had abated. We made good progress around Cove Point. The fog continued to lift throughout the day. Of note, the water color and clarity were beautiful. We saw scoters, gannets, oldsquaw, and buffleheads. We motored all the way to Annapolis, made the 7:30pm opening of the Spa Creek Bridge, and took a mooring in St. Mary’s Cove. We launched Coquille and I rowed Murphy to shore for a brief walk. Then, Dobbs rowed the two of us back in for a celebratory night out - Painkillers at Pusser’s and dinner at Davis’ Pub. It made a late night for us, but experiencing the sights, smells, and tastes of home was worth it.